The Fairfax Board of Supervisors presented FOTO nominiee John Houser, Occoquan Regional Park Manager with the distinguished Environmental Excellence Award for his environmental stewardship and his leadership efforts in support of cleanup events held by the Friends of the Occoquan (FOTO) of the River and his ability to mobilize volunteers to enhance the Occoquan River. Mary Zamon, president of the Occoquan Water League (OWL), presented the Lenehan Award to German & Alex Vanegas for their contribution of the preservation of the Occoquan River. Other recipient honored were Earnie Porta & Jim Zawlocki. The ceremony took place at the Bottle Stop Wine Shop in the beautiful little town of Occoquan, VA. German accepted the award in the name of the volunteers that every year work to keep the Occoquan clean. Alex thanked all the leaders, like Mary and Earnie who help FOTO to accomplish its goals. <?xml:namespace prefix = st1 ns = "urn:schemas-microsoft-com:office:smarttags" />PRINCE WILLIAM COUNTY, On Friday, February 25, 2011, the Friends of the Occoquan (FOTO) received the Conservationist of the Year Award at the 33rd Annual Prince William Ducks Unlimited Annual Banquet and Auction. The Prince William Soil & Water Conservation District (PWSWCD) nominated FOTO for the 2010 Ducks Unlimited Conservationist of the Year Award. Kate Norris of the PWSWCD stated that �FOTO has truly been a leader in the community, helping the environment through meaningful projects, valuable partnerships, and volunteer mobilization.� Alex Vanegas, Executive Director of FOTO, received the award on behalf of the organization. The award was presented by Ben Thompson, Vice Chairman of the PWSWCD, and Chip Rohr of the Ducks Unlimited. The Friends of the Occoquan is a non-profit organization that was formed in October1999. 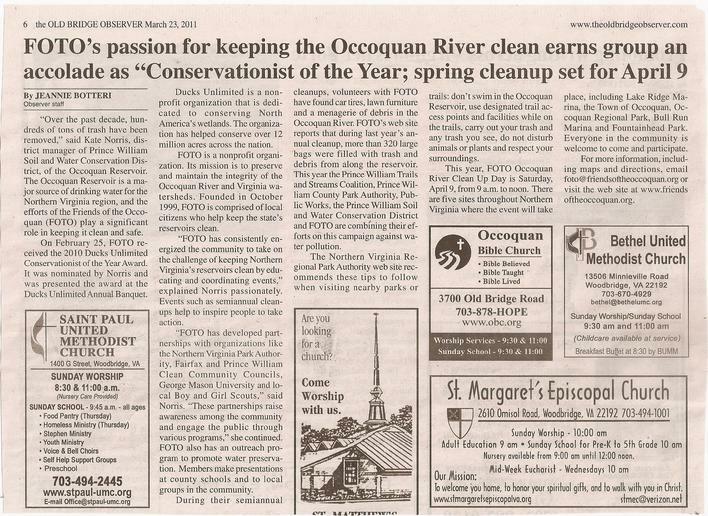 The organization consists of local citizens whose mission is to preserve and maintain the natural integrity of the Occoquan River and other Virginia watersheds by promoting community awareness through public and private partnerships. FOTO has consistently energized individuals, community and business groups to take on the challenge of keeping Northern Virginia�s Reservoirs clean, by educating and coordinating events to remove as well as control man made pollution. Throughout the past decade, this message was conveyed to schools, civic groups and community organizations, as well as local and federal government agencies. Over the past ten years, FOTO has consistently worked to coordinate watershed management efforts and programs including the Semi-Annual Fall and Spring Cleanups, Watershed Education Activities at Prince William County Public Schools, participating in Regional Watershed Taskforces, and the development of Public Service Announcements. These efforts are very significant since the Occoquan Reservoir is a major source of our drinking water here in Northern Virginia. As part of FOTO�s outreach efforts, the organization has successfully engaged the public through various programs. One successful program is to connect with the Spanish speaking community of Northern Virginia to become stakeholders of our watersheds and become active in maintaining clean and safe our rivers. As part of this effort, FOTO has installed bilingual signs videos, literature and some TV programs. Altogether, the Friends of the Occoquan have played a major role in preserving one of the region�s most important natural resources, the Occoquan Watershed. FOTO�s perseverance and dedication to environmental has been sustained through the efforts of its volunteers and members as well as the strong bond it has developed with local groups and organizations that share the same passion. For more information on FOTO please visit their website at www.friendsoftheoccoquan.org. After hors d’oeuvres and socializing, Renate G. Vanegas conducted the US Flag Pledge of Allegiance, Lynn Jost sang the National Anthem and Alex Vanegas presented the award certificates. Forty attendees in addition to FOTO’s Board of Directors, John Rothrock, Reza Rafi and German Vanegas were present. Award recipients were: Donna Flory, Elaine Sours, Ed Powell, Bull Run Rotary Club; Duane DeBruye, Lake Braddock Crew; Bob Lerch, José Gayoso, Christine Lerch, Bill Olson, Mike Smedley, Deb and David Buffington, John Houser, NVRPA; William Walsh, American Water; Christine Vineski, Lane Construction Co.; Claudia Cruise, Ernie Porta, Jane England and SGM (RET) Joe L. Neely, SFC (RET) Fred Elliott, LTC (RET) Victor Burnette, LTC (RET) Franklyn Matthews, 1SG (RET) Daniel Jackson; Mike and Judy Lenehan, Vernon Bahm, Cub Scout Pack 1365; Hassan Thompson Girl Scout Troop 3287; Rich Sackett, Boy Scout Troop 1369; Glenn Richman, Carol Amoakuh and Wendy Wilkerson Cub Pack 1350; Randy Reid, Aileen Streng, Deb Oliver, PWC Public Works; Hafez G Al Haj, Bonnie Phillips, Michelle Mcquigg and John Fowler. Thanks to Mirian Vanegas for taking pictures of this event. The Optimist Club International of Manassas presented FOTO with a Certificate of appreciation for their environmental efforts. Sam Shankar, President of the club and Lucy Beauchamp, Chairman of Prince William County School Board presented the award to Renate and German Vanegas, FOTO directors. PRINCE WILLIAM COUNTY, VA: On Thursday, August 24, 2006 the Friends of the Occoquan (FOTO) was honored by the National Fish and Wildlife Foundation and the Chesapeake Bay Program as one of sixty-eight community-based organizations to receive funds from the Small Watershed Grants Program. At the Announcement Ceremony in Annapolis, Maryland; special guest speakers, U.S. Rep. Benjamin L. Cardin and Sen. Paul Sarbanes recognized grant recipients for their efforts in restoring and protecting the Chesapeake Bay watershed. Over $2.6 million in Small Watershed Grants were awarded from the Environmental Protection Agency (EPA) in an effort to promote community involvement to develop and implement watershed management plans.This is the third consecutive year that FOTO has received funding from the EPA. This year�s grant will be used to administer FOTO�s Community Watershed Outreach Program which focuses on engaging our diverse community in watershed awareness and stewardship. This program is a multi phased project that includes bilingual public service announcements (PSA), videos, watershed signs and literature designed to educate the public on issues facing their community�s respective watershed. The Award Ceremony was held at the Adams Academy in Annapolis, MD. Main speakers included: The Honorable Senator Paul S. Sarbanes; The Honorable Benjamin L. Cardin; Rebecca Hanmer, Director, Chesapeake Bay Program Office; John Catena, Northeast Regional Supervisor, NOAA Restoration Center and Thomas Kelsch, Director of Conservation Programs, National Fish and Wildlife Foundation. Following are some pictures of this event.